I loved Mia McPherson's post earlier this month helping people identify big, white wading birds (if you missed it, you should check it out). 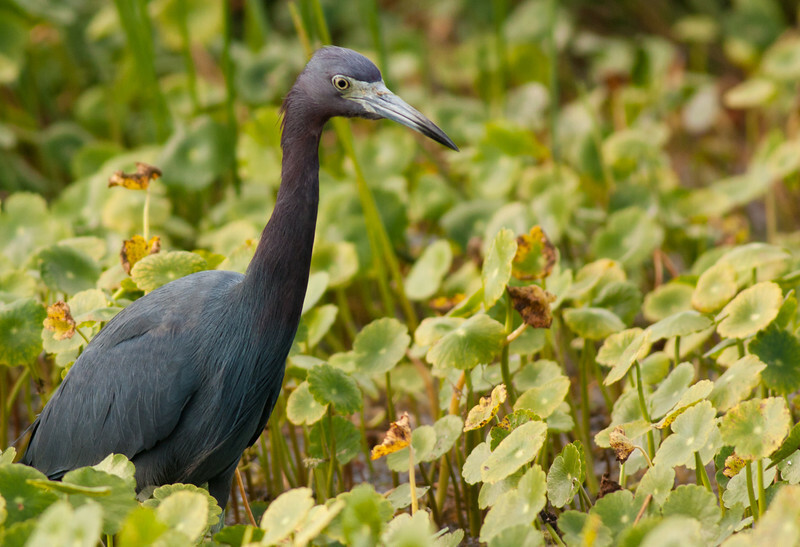 I thought it would be good to piggyback on that post to cover all the non-white wading birds you can expect to find in the U.S. For the sake of space, I'm only going to cover wading birds in the family Ardeidae, which includes all bitterns, herons and egrets. Bitterns are generally brown and streaked in their adult plumage and are more secretive than herons and egrets. The only difference between egrets and herons is that egrets have long plumes during breading season. All of them can be found in Florida within an hour's drive from my house. 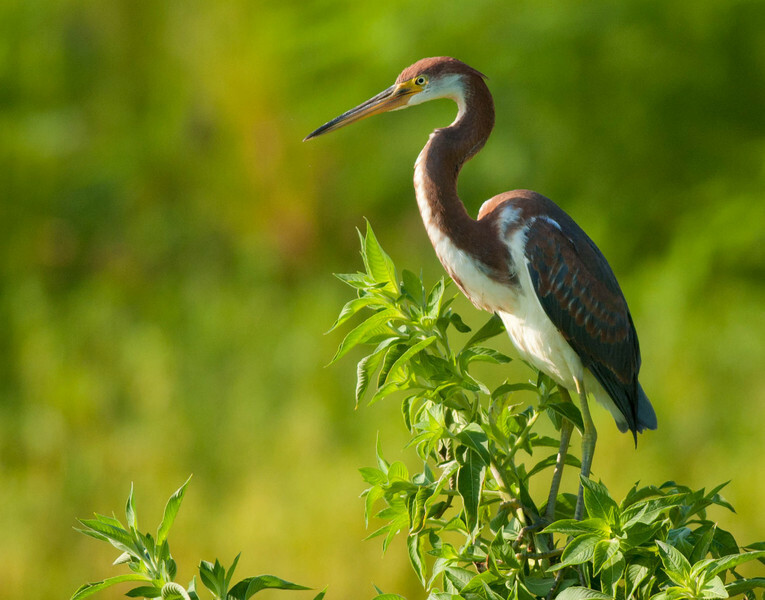 Reddish Egrets are the only bird named an egret that is not white in its adult plumage (except, of course, the white morph of this species). It's a medium-sized egret with a wingspan of about 46 inches. They can be easily identified by their reddish color, especially on their neck and head, a "shaggy" appearance, and a bill that is darker at the tip. But even if you can't see their color, you may be able to identify them simply by the way they hunt. They dart around and spread their wings as they plunge their bills into the water. They act kind of like an egret with ADHD. 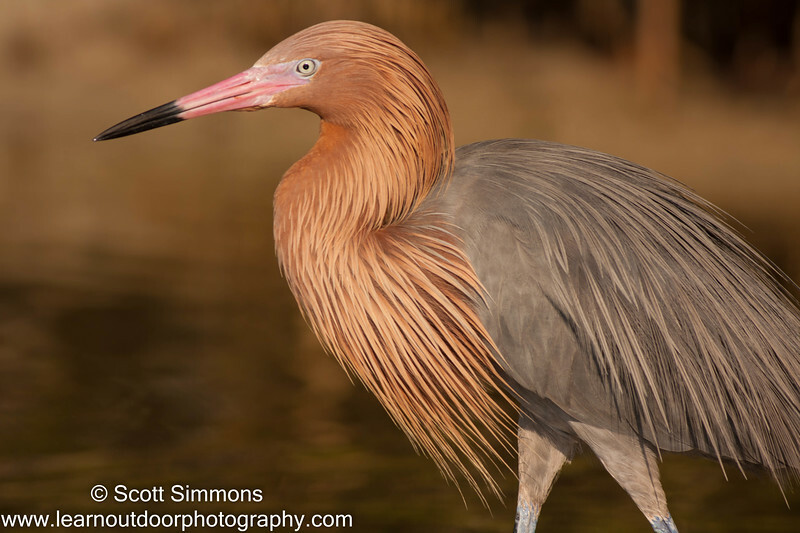 Reddish Egrets are a threatened species, with only about 2000 nesting pairs in the U.S., mostly in Texas and Florida. 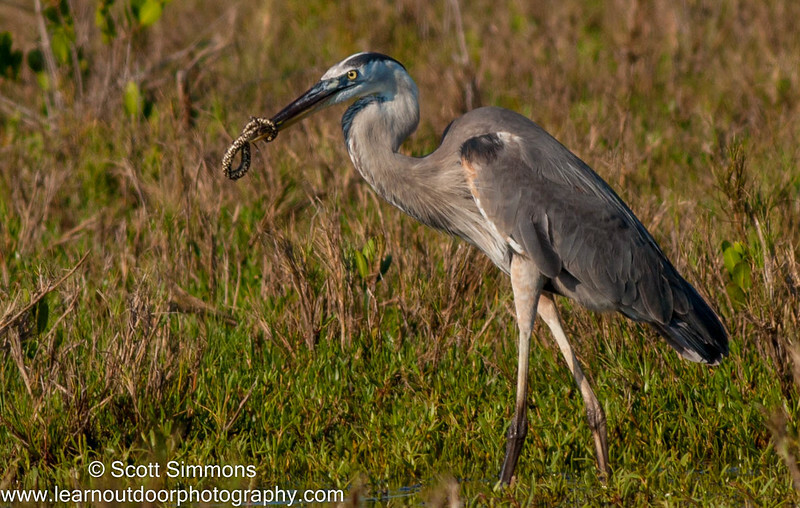 Great Blue Herons are our largest heron with a wingspan of about 72 inches. They are relatively easy to identify with their slate blue back, white on the head and a bill that's darker on the top than on the bottom. They're so common you may be tempted to pass them by without much attention, but if you do, you may be missing out. After all, being as large as they are, they can take large prey. I've seen them with snakes and fish seemingly too large to swallow, but they manage to get them down. 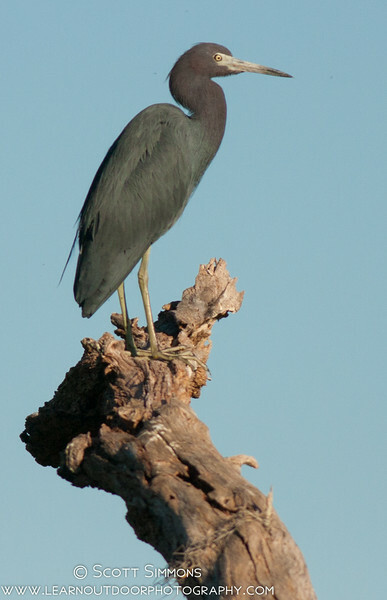 Little Blue Herons are much smaller than Great Blue Herons, with a wingspan of only about 40 inches, and their coloring is comparatively plain. 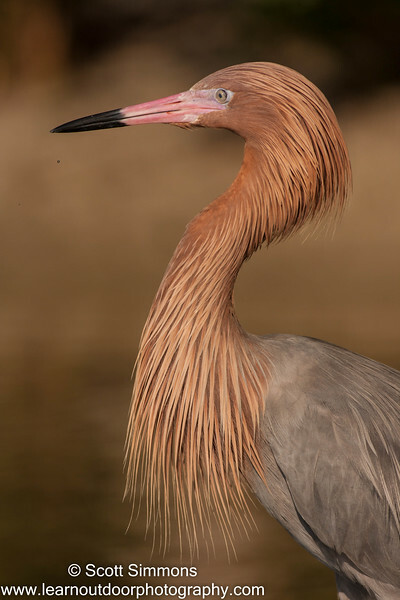 Like Reddish Egrets, their necks and heads can have a slightly reddish appearance, but it's much more subdued, and they don't have the "shaggy" look that Reddish Egrets have. 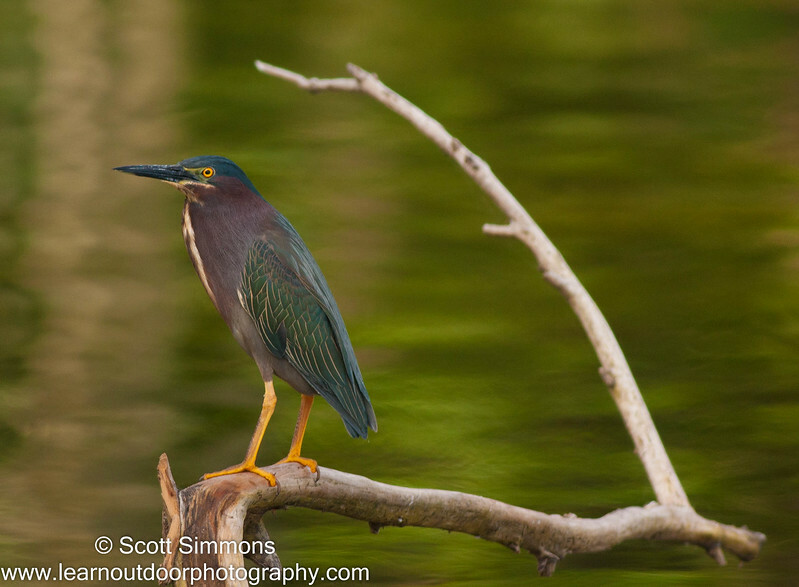 Green Herons are one of our smallest herons, with a wingspan of only about 26 inches. 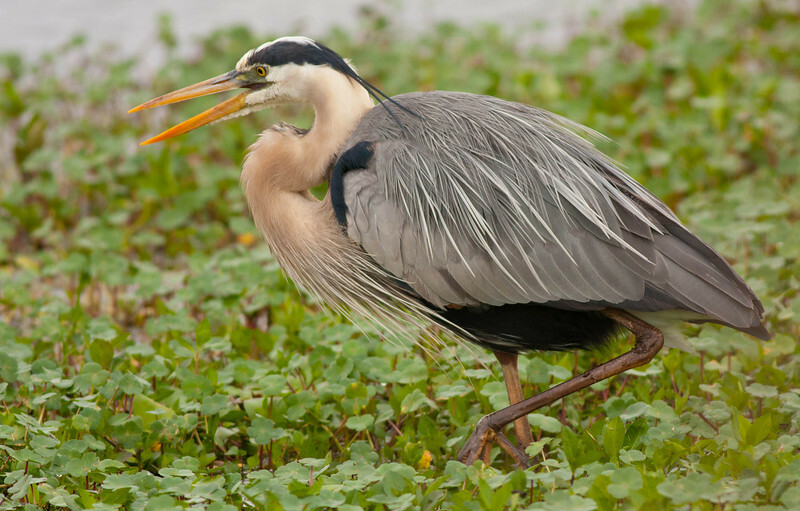 This heron has a dark crest, and sometimes you can find them with their crests raised. 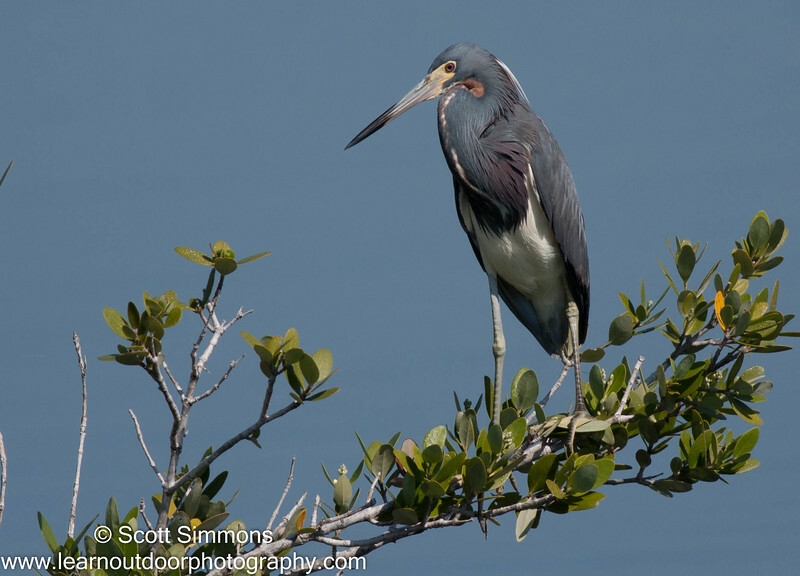 They are more secretive than many other herons, but sometimes you can find them out in the open perched on a tree branch with their heads pointed down to the water just waiting for the right moment to strike. 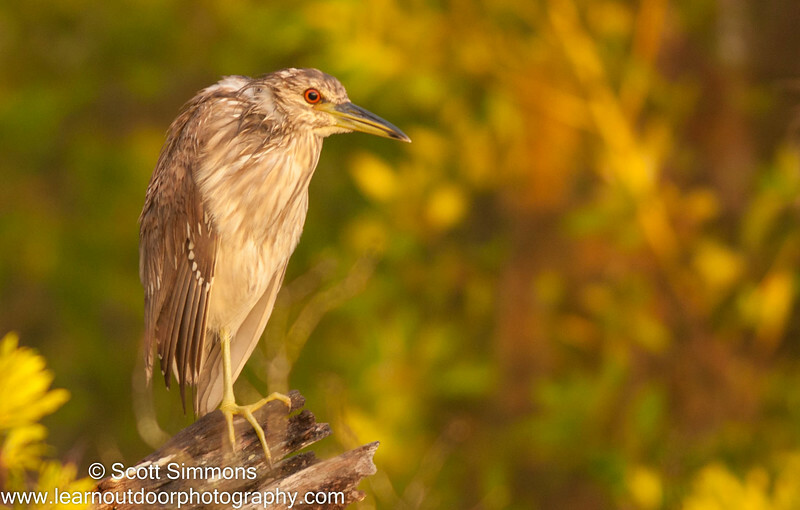 Night Herons are aptly named, since they are most active at night. 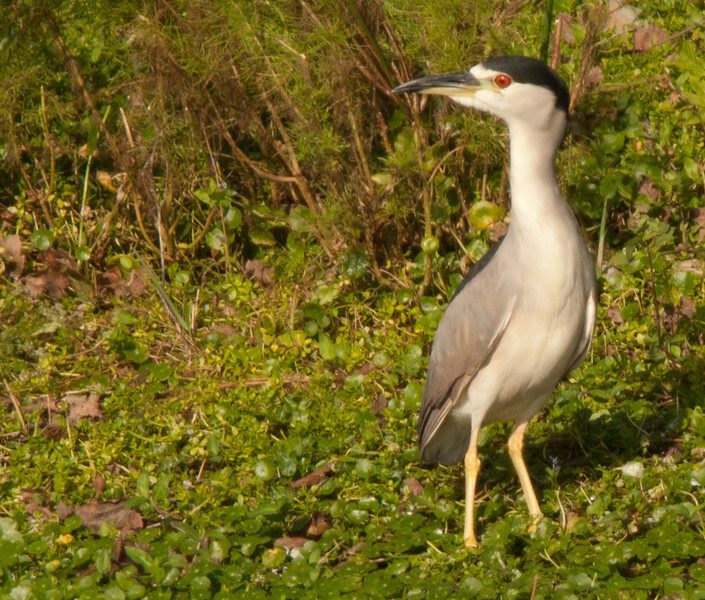 Black-crowned Night Herons have a wingspan of about 44 inches and are a beautiful white, gray and black. They have a black crown and a black streak down the back. 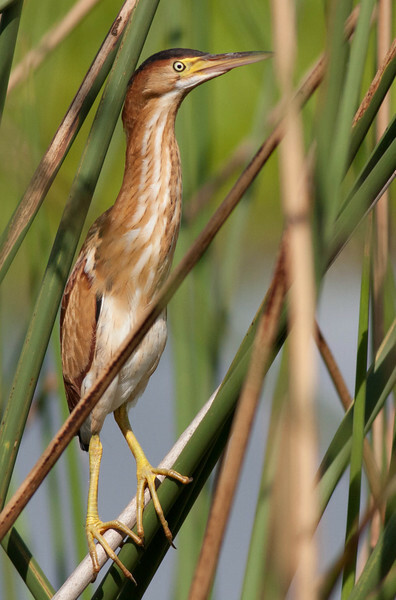 Immatures are brown with white flecks on their wings and a bill that's only dark on the top. 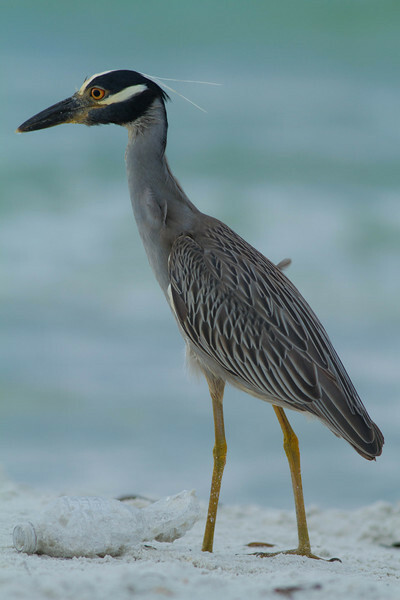 At first glance, Yellow-crowned Night Herons look a lot like Black-crowned Night herons, but they have yellowish-white crowns an all-black bill. They are also slightly smaller, with a wingspan of about 42 inches. 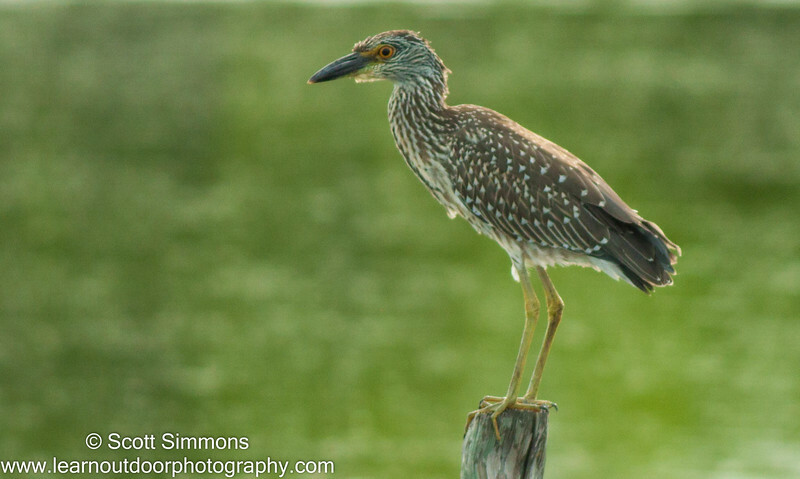 The all-black bill helps distinguish immature Yellow-crowned Night Herons from Black-crowned. American Bitterns are our largest bittern, with a wingspand of about 42 inches. They can be extremely hard to find, since they are so well camouflaged. Your best chance to find them is to catch them in flight, but occasionally you may find them in the reeds or even out in the open. 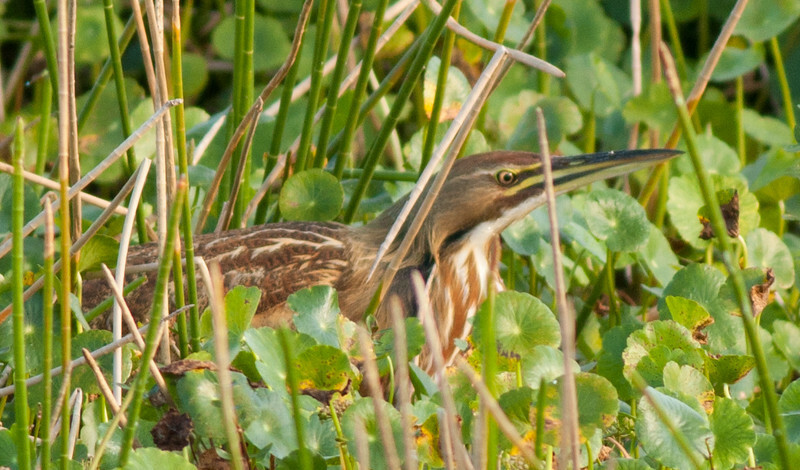 Notice that American Bitterns do not have white flecks on their wings like immature night herons. 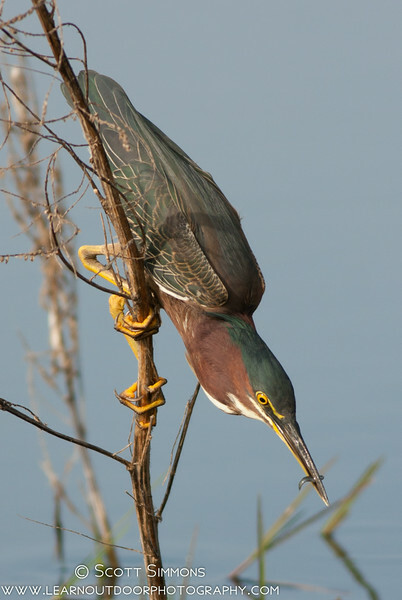 Least Bitterns are even smaller than Green Herons with a wingspan of only about 17 inches. 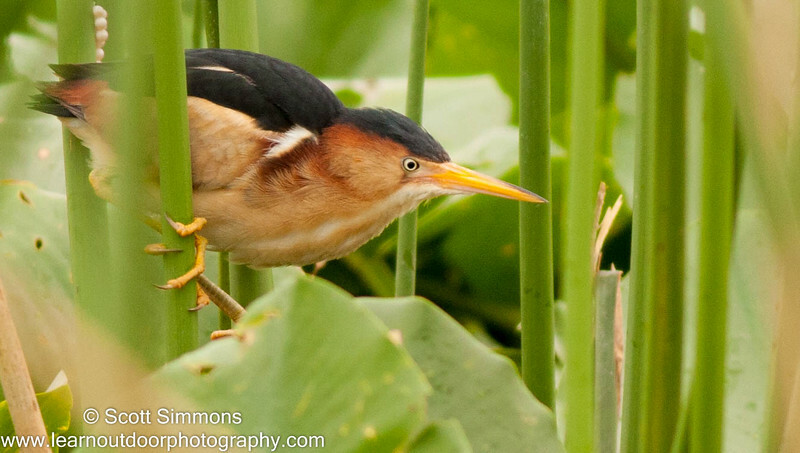 Least Bitterns can be distinguished from Green Herons by their orange and white streaked neck and chest as well as by white patches on their wings. I love this post Scott! It piggybacks well with my Big White Wading Bird post! What a fantastic compilation of beautiful images and information Scott! Great post! Great post Scott! Beautiful photos and great highlights of these waders! It is a great message. We are thrilled. They know and love the Canon Digital monsters too. Japanese children sports day has ended. Now is the season of autumn leaves taken. ...great post! 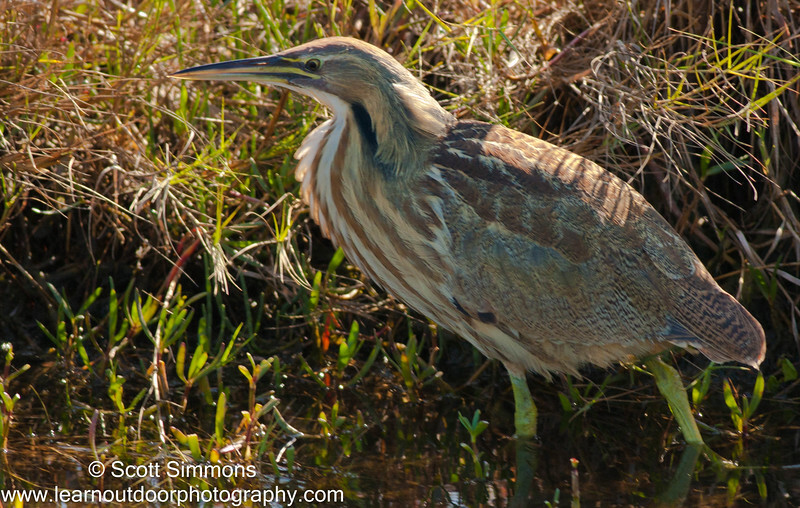 I loved the the Reddish Egret photos...and the Green Heron photos too...and the Least Bitterns...(I love them all!). Outstanding post filled with interesting information! I oohed and ahhed while scrolling through your spectacular photographs. Gorgeous birds! 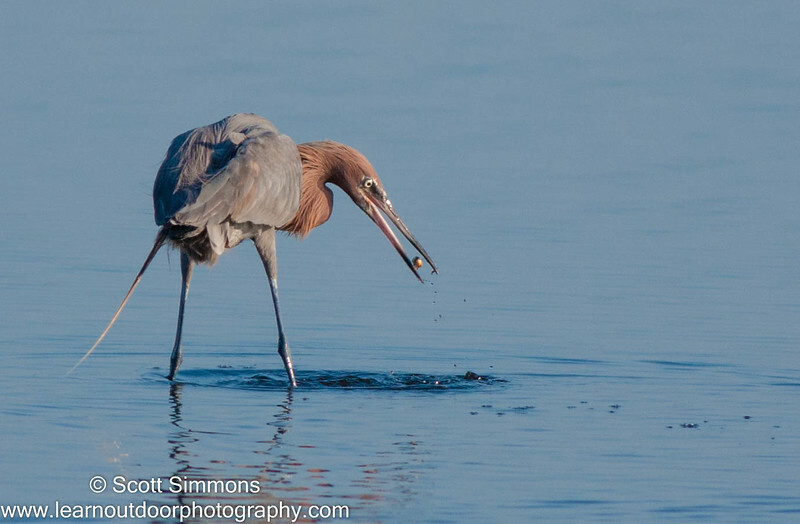 Wow - your Reddish Egret photos are stunning, Scott. Thanks so much! They're one of my all-time favorite birds.